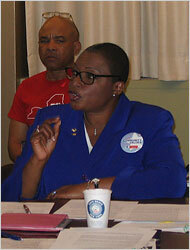 Earlier today, Desiree Pilgrim-Hunter officially gave notice of her intention to run for the 33rd NYS Senate District. Via email sent to a Friends of Desiree Hunter list, supporters were invited to an announcement of her candidacy today in the Bronx. Desiree Pilgrim-Hunter, community organizer and president of Fordham Hill Cooperative Apartments, will announce her candidacy for the New York State Senate, representing the 33rd District, in front of scores of supporters. Hunter is challenging the incumbent State Senator Pedro Espada, who has been widely accused of not living in the 33rd Senate District and for orchestrating the 2009 coup in Albany. Hunter also made news earlier this week when Lisa Hernandez Gioia confirmed that she was speaking with Hunter about fundraising.